An enthusiastic football player, Kieran had just got on to the first team at local club, Boldmere St Michael’s, when he tore his knee ligaments. After reconstructive surgery and extensive rehabilitation exercises, Kieran found he was able to return to playing football, where many others wouldn’t have been able to. It was through this experience that Kieran first found the benefit of Sports Therapy, and what ultimately inspired him to pursue it as his career. 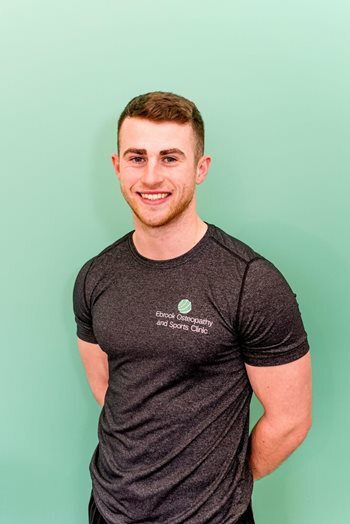 Kieran’s treatments are focused, with hands on techniques to reduce muscle tension and pain – followed up with specifically designed exercise plans to get his patients back to full function. By completing his Personal Training Level 3 qualification, he is able to bring his clients a step further into improving their sporting performance. Having completed his bachelor degree at University College Birmingham, Kieran is very much still at the heart of our local sporting community – playing football and socialising with his teammates from Erdington and Sutton Coldfield.